I was missing a lot of teeth, so I wanted to take care of that. Also, I wanted a nicer smile, whiter teeth, a Hollywood smile. I didn’t smile so much when I had photo shoots. I couldn’t whiten my teeth because I had so many root canals, and if you whiten your teeth it gets spotty. I felt not too confident about my smile. I had terrible headaches and was in the emergency room three times because my bite was so difficult. It’s not just the headaches. The muscle tension in the neck, shoulders and back, crunching your teeth with your bite is not correct. My headaches were so terrible. It was a couple of weeks after I saw Dr. Rye when I felt complete relief. It wasn’t just better and better and better. It just turned off my headaches. I felt 100% better. No more medication. I was much happier. My husband wanted to call Dr. Rye after a couple of weeks to thank him and tell him he’s a miracle worker. I think it means a lot. It’s better than plastic surgery. A girl always wants to be prettier. It’s a big change. People tell me I look younger, much, much younger, which is surprising that teeth can make you look younger. I’m so appreciative. It really changed my life, not just that the pain is gone. I look much better. I feel better. Now I’m the happiest girl. My husband thinks it has changed both of our lives. I can’t put into words how much I appreciate Dr. Rye and what he has done for me, not just because my headaches are gone. I feel very attractive and young and fresh, and I really appreciate it. Orsi suffered all of her life with tooth aches, tooth loss, jaw pain, headaches, neck and shoulder aches, and a collapsed vertical dimension of her face. She was a well known runway model, but did not have the confidence to smile. We employed Physiologic Dentistry to give her a comfortable, relaxed bite. Her symptoms disappeared in about two weeks. 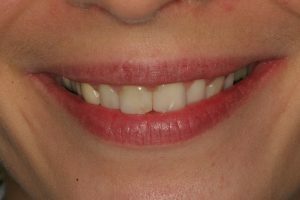 We increased her vertical dimension, placed implants and all porcelain crowns and veneers. I am so happy we could change her life in such a positive way. Isn’t she beautiful?